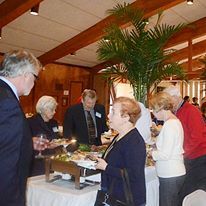 Temple Sinai offers many opportunities to gather and socialize. We have community dinners before Shabbat several times a year. The Oneg Shabbat (“Joy of Shabbat”), after the service, is a good way to meet old and new friends; it occasionally features a presentation or discussion. Temple Sinai also hosts receptions for celebrations such as members’ Bar/Bat Mitzvah. We have special celebrations or observances for most Jewish holidays–the traditional Passover Seder, a Tu B’Shevat seder, Purim and Chanukah plays written by our members, and an outdoor sukkah. 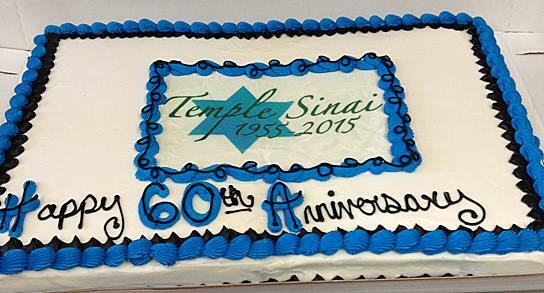 We had an Open House to let visitors and prospective members learn about Temple Sinai and our Religious School, and we had a memorable 60th Anniversary party. The congregation gathers for fund-raisers events that feature music, or a gala social event, and our Congregational meeting to elect officers and review business features a special Brotherhood brunch. Sisterhood schedules excursions and a bimonthly Rosh Chodesh observance. There are many ways to volunteer (see “volunteer” menu item, or contact activity leaders). Temple Sinai participates actively in the local United Jewish Community board and in events at the Jewish Community Center, such as our booth at the Jewish Food Festival each spring. Larry Linn’s latkes are in high demand there, as are the corned beef sandwiches that we sell to the public twice a year. Rabbi Sokol is active in the community Rabbis’ Round Table and in the annual Holocaust observance. Temple Sinai members are active in the local Lifelong Learning Society as students, volunteers, and teachers, and in other community organizations. As mentioned under “social action”, we volunteer as a group to assist the PORT homeless shelter over Christmas and we assist Transitions at the holidays as well.